Advance Tabco CRB-33C Lite Three Compartment Stainless Steel Bar Sink - 36" x 21"
Wash, rinse, sanitize, and more with this versatile Advance Tabco CRB-33C three compartment stainless steel bar sink. Each bowl boasts a fabricated, seamless design that measures 10" x 14" x 10". A 4" backsplash will keep the nearby walls and floors dry, which reduces the potential for wet, slippery surfaces in a dishwashing area. 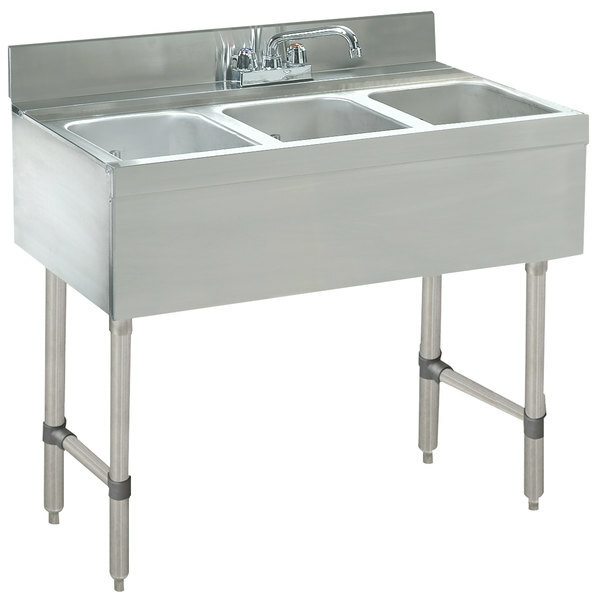 This bar sink is designed for exceptional durability and years of high volume use thanks to sturdy, all stainless steel construction along with side cross-bracing. Wash all your restaurant and kitchen supplies with the unit's 10" deck mount swing spout faucet. Additionally, each sink bowl includes a 9" high overflow pipe with 1 1/2" IPS drain. For added storage, this series of sinks boasts an integrated rear deck. Each faucet meets federal lead free standards, making this Advance Tabco CRB-33C bar sink the perfect addition to any commercial kitchen. Overall User Rating: Advance Tabco CRB-33C Lite Three Compartment Stainless Steel Bar Sink - 36" x 21"
This sink was the perfect size to meet the small space we had to work with behind our bar. It also came with the faucet, which made installing it a breeze.